Share of Mind, Share of Heart: Marketing Tools of Engagement for Nonprofits. There are dozens of books out there on marketing your nonprofit to attract new supporters, advance an advocacy agenda or keep the donors you have. But this is the first book that I’ve read that specifically targets marketing “from the inside-out.” That is, this book focuses on the people who work or volunteer for you. If you haven’t read Yes! 50 Scientifically Proven Ways to be Persuasive, by Noah J. Goldstein, PhD et. al. run and get a copy (or request it from your local library). This nifty little book provides useful insights from research that the authors and others have done to understand how people respond to attempts to persuade them. In some of the findings you’ll find validation for practices you already have in place. In others, you might be surprised to find that something you might think is persuasive may actually have the opposite effect. BUY IT FOR YOUR BOARD TODAY! Thank you!. Gayle’s newest book was just released by Emerson and Church, publishers of Contributions Magazine. It’s an updated version of How are we Doing? 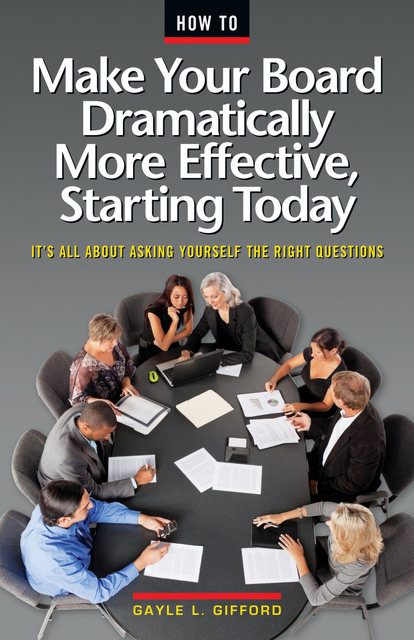 her one-hour read to help your board start a conversation about its own effectiveness. A high-performing, diligent board that takes its responsibilities seriously is the Holy Grail of nearly every nonprofit in the U.S. Such a board means more money raised, swifter policy decisions, steady governance, and less ibuprofen for the CEO. But can you realistically get there from here? Can you put your average or good board on the road to greatness? 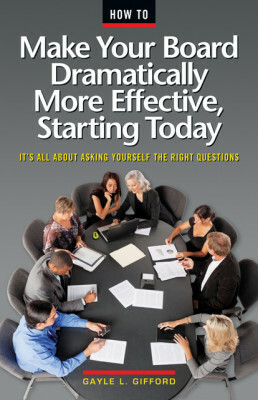 Indeed you can, says Gayle Gifford in How to Make Your Board Dramatically More Effective, Starting Today. And you’re closer than you think. How well do we know our community’s needs? Do we know if our programs are having an impact? Have we given our CEO the necessary support? Have we decided the board’s role in fundraising? Do our committees improve the functioning of our board? Does our board govern and resist the temptation to manage? Is our relationship with staff what it should be? Maybe the innovation factor in US enterprises would increase dramatically if we had mandatory three-day weekends every week. Sometimes a little reading is a good place to start. Staff or directors of nonprofit organizations come to us every day seeking our help to improve their functioning. And while I would never discourage anyone from that, I also encourage my clients and prospective clients to do some reading on their own. Thank you so to my colleague and friend Jane Arsenault of FioPartners for forwarding this report. (If you are interested in nonprofit alliances and haven’t read through Jane’s 1998 book Forging Nonprofit Alliances, you’ve been missing one of the pioneering works on this topic). “Outsourcing back-office services…” is a study conducted by the Management Assistance Group for the Eugene and Agnes E. Meyer Foundation of Washington, D.C. It confirms through a study of Meyer grantees, industry experts and other literature what many of us have been thinking about, wishing for and experimenting with for a number of years. Outsourcing may present an opportunity for small organizations to improve their back office. There may be new for-profit business opportunities in providing these services. Because of their small size and lack of spending on any back office, outsourcing doesn’t offer immediate cost savings for most small organizations. But the report goes on to say that it could help free time for more focus on program and strategy. Outsourcing needs to be approached cautiously by both organizations and their funders. Large nonprofits and nonprofit networks have been outsourcing many back office functions for years. In our experience, small nonprofits haven’t been profitable enough for for-profit businesses to service. The lack of money to be made providing these functions has been a real barrier to the development of many services from which small organizations could benefit. And small organizations simply haven’t had the time, expertise or money to solve this problem for themselves. Across the country, larger nonprofits are stepping up to provide some of these services. All types of creative arrangements have been developed that don’t force small organizations to merge and thereby dissolve the important, close constituency and localized advocacy work that so many of our smallest nonprofits provide. With the current economic crisis and a renewed interest in exploring nonprofit joint ventures, the time may finally be right for a thousand flowers to bloom in this area. Are your volunteer practices turning volunteers off forever? 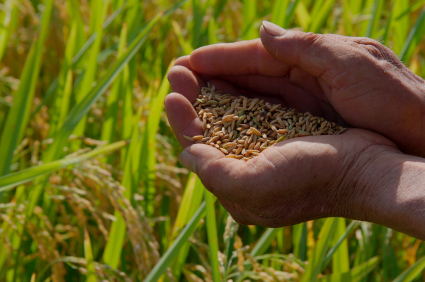 Are volunteers a finite or infinitely renewable natural resource? Does each nonprofit have an obligation to our whole sector to create satisfying experiences that regenerate volunteers? Are poor volunteer practices not only driving people away from the offending organization but also souring volunteers against any volunteer service in the future? These are some of the questions provoked by an intriguing article in the article “It Ain’t Natural: Toward a New (Natural) Resource Conceptualization for Volunteer Management” in the August 2009 edition of Nonprofit and Voluntary Sector Quarterly . While the title screams academia, the ideas raised by the authors Jeffrey L. Brudney of Cleveland State University and Lucas C. P. M. Meijs of Rotterdam School of Management, Erasmus University, deserve serious discussion and wide exposure within our sector. Citing a a study done by the Corporation for National and Community Service, Brudney and Meijs warn that “a staggering one in three Americans evidently dropped out of volunteering between 2005 and 2006.” They note that other studies document similar problems in other countries. The authors suggest that nonprofits in general are too preoccupied with recruiting volunteers and don’t pay enough attention to retaining them. What if, the authors suggest, instead of treating “volunteer energy” as a resource with an inexhaustible supply, we perceived volunteers as a resource that could actually run out? How would our behavior need to change? I find this concept incredibly intriguing, especially because it fits very nicely into my”we’re all in this together” framework of civil society. Imagine that you are a first time volunteer. You’ve been thinking about doing something good for your community so you’ve found your way to a volunteer job through family, friend or volunteer center. You’re excited, but a little unsure of your role and how you might contribute. It’s likely that it may take quite a while before you hear from the organization at all. Or, they contact you quickly but they don’t really have any volunteer needs right now. No one takes the time to find out what skills you have or what else you might have to offer. I regularly encounter individuals, usually good hearted souls, who have done so little searching for best practices about nonprofits or the issues they are addressing. I’m always curious which, when there is such great stuff out there, largely for free, they didn’t take the time to look.